Componentwise product of two textures. Return the texture value at its. filter Specifies whether a filtered texture lookup is desired. Note that this does not mean that filtering will actually be used. Return the component-wise average value of the texture over its domain. Return a bitmap representation of the texture. When the class implementing this interface is a bitmap-backed texture, this function directly returns the underlying bitmap. When it is procedural, a bitmap version must first be generated. 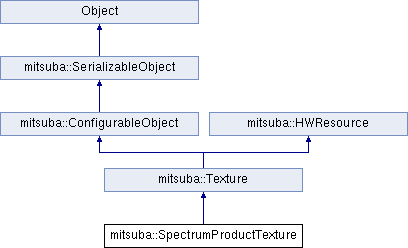 In this case, the parameter sizeHint is used to control the target size. The default value -1, -1 allows the implementation to choose a suitable size by itself. Return the component-wise maximum of the texture over its domain. Return the component-wise minimum of the texture over its domain. Return whether the texture takes on a constant value everywhere. Return whether the texture is monochromatic / spectrally uniform. The implementation may conservatively return false if it is not sure. Serialize to a binary data stream. Return a human-readable string representation of the object's contents. This function is mainly useful for debugging purposes and should ideally be implemented by all subclasses. The default implementation simply returns MyObject[unknown], where MyObject is the name of the subclass. Does this texture perform any pre-filtering when ray differentials are available?